When is a bus not a bus? When it doesn't exist. Like all city centre bus operators, Dublin Bus are focusing their efforts on key corridors. But what do you do in the early morning, when there are no buses to advertise? Well, Dublin Bus have a solution to that: they make one up. 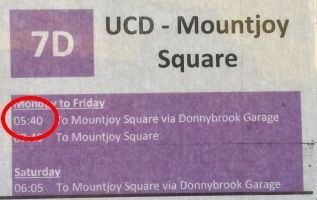 This poster at UCD bus stop claims there is a 05:40 route 7d. 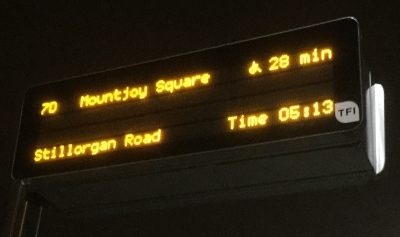 It specifically says this is from UCD (it would be 05:20 if it were from the terminus). But there is no such bus - the first departure of the day is a different route which comes at 06:23. The real 7d takes a completely different route, going nowhere near here. Was it's inclusion just a simple typing error? 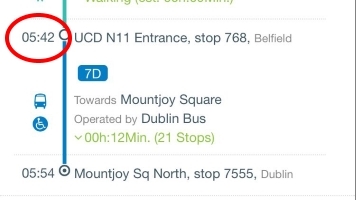 No, because the data Dublin Bus supplied to Transport for Ireland's journey planner also believes the bus exists, albeit at an estimated arrival of 05:42. As a result, the app advertises the service too. Take a look at this different poster for the same bus. Dublin Bus use the unusual system of printing off a list of departures and copying it, so it's no surprise that they haven't bothered to remove the one that doesn't stop here. Because obviously when passengers are looking at a bus stop they want to see the times for buses calling at other stops. 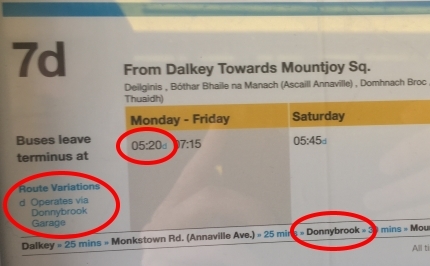 To their credit they have at least pointed out that the bus takes a different route via Donnybrook Garage, but the normal route (above the yellow bar) says it goes via Donnybrook - so how is anyone supposed to know what's different? At this point you would hope it's a mistake that has been copy-and-pasted a few times. It isn't. A bit of digging reveals there are seven different buses all suffering from the same problem. As a result, people are heading out in the early hours and waiting for advertised buses that simply don't exist. People are committing to hours they can't work on the basis of incorrect information. Shops are going unopened. It's falling on random Twitter users to advise others on why the buses don't turn up. The same user claims the issue has been reported to Dublin Bus repeatedly. Dublin Bus don't seem to be aware, because they've even offered to investigate the bus that doesn't exist. Thanks for that. We will look into this and get back to you as there appears to be some sort off issue there. We apologise if this has caused you any disruption. These days everything is designed by a computer. Take another look at that yellow 7d poster. Two of those three buses have the same variation on them; so why not make those the normal route and make the remaining one trip the one that is the exception? It's a classic case of not thinking about the passenger. What's the point of a poster where two thirds of the buses don't call at that stop? How does a list of buses at a stop 20 minutes away help the passenger? I actually have some sympathy for Dublin Bus here. These things happen. But you're supposed to spot them. Besides, if your network is too confusing for a computer, how are your passengers supposed to use it? And if it doesn't follow the 7d route, why is it called the 7d anyway? This is a classic argument in bus circles. Bus managers (the ones who never go outside their offices) believe if you have a route 1 and a route 1A, people won't appreciate that they have two buses to get them from A to B. This is true. Bus customers (the ones who use them) point out that what's more important is that everybody who lives on the 1A route only needs to know which ones are going their way. As you can guess, I'm in the latter category. Issues like this wouldn't happen if the 7D detour had a separate number. But 7dA (or maybe 7Di) would look silly. This brings me to the reason the 7d was created in the first place: it, and it's sisters the 7, 7a and the 7b were supposed to rationalise the 7 corridor. It was a management decision. In the couple of days I was researching for this page, I saw the bus driving around with 7, 7A and 7D on the front - even though passengers are looking for a 7D. If the drivers are getting confused by it all, what must the passengers make of it? Why do bues deviate from a single route? It's a necessary evil. In the early morning, when there aren't many people waiting for buses, you need to pick up as many people as possible using as few vehicles as possible. As a result, you save time by skipping the really quiet bits, and stick a few lengthy diversions on to cover for other routes. It's quite clever - when you explain what you're doing. In this case, I suspect the truth is it diverts to take staff to Donnybrook bus garage. What do the electronic bus stops do? Some people believe the electronic (RTPI) bus stops are always wrong. I don't, but this doesn't help their cause. At 04:43, the bus stop will come alive from its sleep to announce that there is a 7d due, and will start counting down to it. As for the passengers, well, they can take solace that Dublin Bus are now looking at the issue.